My approach to military history reflects my career as a professional soldier, all of which was spent either with troop units or as a tactical instructor, and my training as a historian at the University of Wuerzburg in Germany. The study of history at Wuerzburg emphasizes the careful analysis of primary source material. In military history this means above all the evaluation of training, doctrine, plans, intelligence estimates, orders, weather, terrain and tactical combat. As a professional infantry officer, I am able to apply twenty years of military experience to this analysis including three years with a German panzer division. I work through military history as though it were an actual war plan or military operation . I have found that many histories of the German army from 1864 to 1914 are based on old secondary sources that do not meet professional military standards and frequently have a nationalistic, patriotic or political agenda. The myths they have established are satisfying to the layman, but militarily absurd. Many of the most widely accepted books on the German army repeat this "common knowledge," however militarily unlikely. "Great Generals" are emphasized instead of doctrine and troop training. "Little maps, big arrows" substitute for the painstaking study of plans, orders and tactical combat. Sweeping and unfounded generalizations take the place of attention to detail. Based on the standards of German scholarship and professional military judgment, I have shown in Inventing the Schlieffen Plan that there never was a "Schlieffen plan" and published the supporting documents in English translation in German War Planning. In The Moltke Myth I prove that the elder Moltke was not a great planner and battlefield leader, and that the Prussians won the wars of 1864, 1866 and 1870/71 because of the tactical superiority of the German army, particularly the infantry. The Battle of the Frontiers, Ardennes 1914 shows that the French did not charge German machine guns, but were defeated in maneuver battles by German units that were tactically superior in every respect. 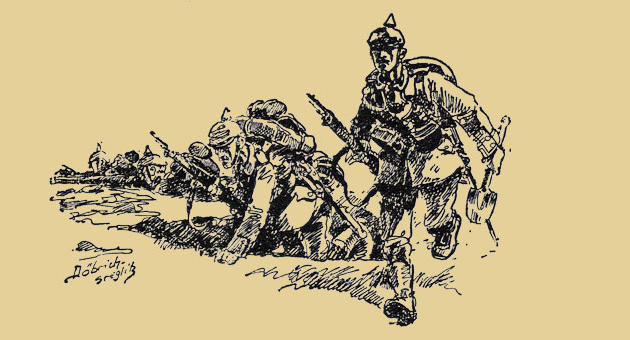 The Mons Myth describes the battle from the German point of view, which has little in common with that of the British official history. Ten Days in August: The Siege of Liege and First Battle of the First World War: Alsace Lorraine give the first real accounts of these battles. I can promise that my work will never merely repeat "common knowledge," that it is thoroughly researched in primary sources reinforced by professional military standards. There is no deference paid to patriotic or political myth or the unsupported opinions of important historians. I seek to establish German military history according to the standard of Leopold von Ranke: "as it actually was." 1970-1990 infantry officer in the US Army. Mortar platoon leader (twice), rifle platoon leader, rifle company executive officer, infantry battalion adjutant, assistant infantry battalion operations officer, company commander in 3rd Infantry Division for over three years, including command of B Company, 2nd Battalion 30th Infantry Regiment (Mech), assistant infantry division inspector general, tactics and NBC instructor, 3rd Infantry Division headquarters commandant, VII (US) Corps liaison officer to the 12th German Panzer Division. Parachute qualified. Legion of Merit for counter-intelligence operations.